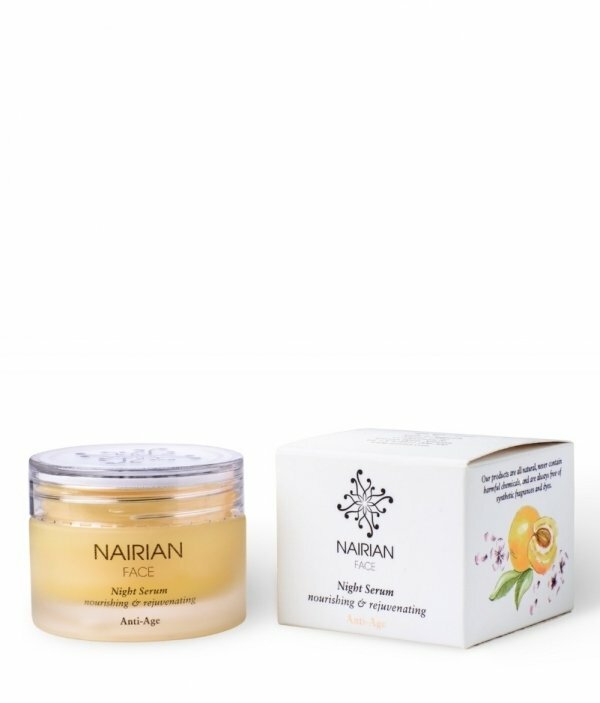 Made with the finest ingredients, the Nairian Night Serum nourishes and rejuvenates your skin. skin. The blend of Rosehip and Sea Buckthorn Oils has extraordinary age defying properties. Evenly massage a generous amount of serum to face, neck and décolletage, and leave overnight. 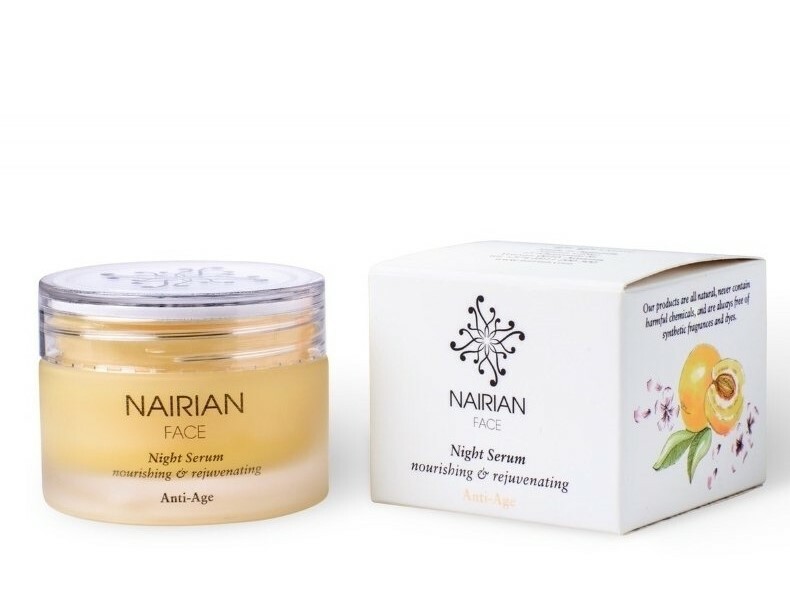 Best applied over Nairian moisturizer, to improve absorption. Aloe barbadensis (Aloe Vera) Leaf Juice, Rosa damascena (Rose) Distillate, Camellia sinensis (Green Tea) Leaf Extract, Linum usitatissimum (Linseed) Extract, Punica granatum (Pomegranate) Seed Oil, Simmondsia chinensis (Jojoba) Seed Oil, Prunus armeniaca (Apricot) Kernel Oil, Helianthus annuus (Sunflower) Seed Oil, MSM (Dimethyl Sulfone), Rosa rubiginosa (Rosehip) Seed Oil, Olea europaea (Olive) Oil, Butyrospermum parkii (Shea) Butter, Glyceryl Stearate, Cetearyl Alcohol, Niacinamide (Vitamin B3), Hydrogenated Palm & Palm Kernel Glycerides, Panthenol, Sodium Stearoyl Lactylate, Benzyl Alcohol, Dehydroacetic Acid, Sodium Benzoate, Allantoin, Tocopherol, Lactic Acid, Citrus junos (Yuzu) Peel Oil, Santalum spicatum (Sandalwood) Bark Oil, Pelargonium graveolens (Rose Geranium) Leaf Oil, Boswellia carterii (Frankincense) Resin Oil, Rosa damascena (Rose) Flower Oil, Commiphora myrrha (Myrrh) Resin Oil, Coriandrum officinalis (Coriander) Leaf Oil, linalool*, citronellol*, limonene**, geraniol*, farnesol *, citral*. Shipping to other international destinations is unavailable at this time.